Milky Way galaxy: Two new discoveries about its spiral arms. 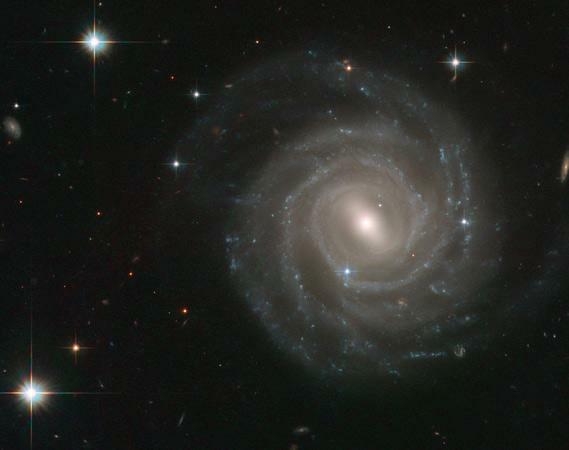 UGC 12158 is a huge spiral galaxy that is a near-twin of the Milky Way. Our galaxy would look much like this if we could see it from 100,000 light years due up. 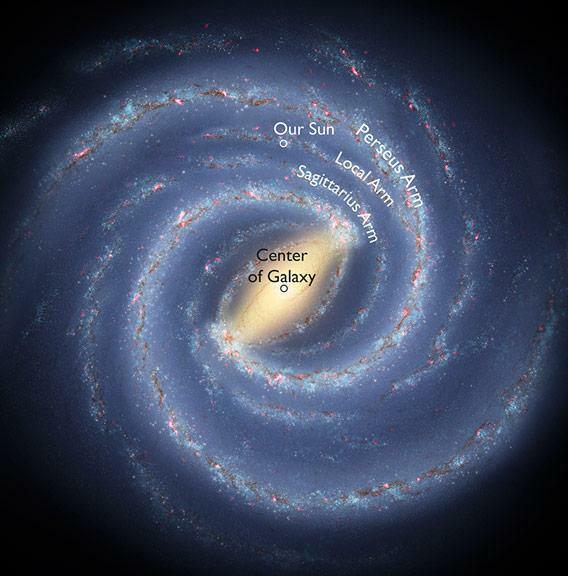 Our galaxy, the Milky Way, is a massive spiral. It’s actually in one of the top tiers of galaxies in the Universe, tipping the cosmic scale at several hundred billion times the mass of the Sun. We’re stuck inside it, so it’s difficult to get the big picture; imagine trying to understand the shape of a forest after being plopped down inside of it, halfway between the center and the edge. And, oh yeah, you’re stuck there, unable to move. Astronomers have an advantage over our lost forest dweller, though: We have telescopes that allow us to see a lot of our galaxy (including using radio waves and other forms of light that allow us to peer deeply into it and tease out some answers). We can also see lots of other galaxies and learn from them. And we also have math and physics, which allow us to investigate why they form the shapes they do. Our investigations have led to two new results that are both pretty cool. One is that we have a better understanding of the way those spiral arms might form. The other is the arm we happen to be in is bigger than we thought. The galaxy is a really huge flat disk, with the spiral arm pattern in it. Stars nearer the core orbit the center of the galaxy faster than ones farther out, and so you might expect the arms to wind up over time. But they don’t. That led astronomers to think of them like density waves, like traffic jams with stars instead of cars. A traffic jam isn’t a solid thing; cars enter it on one side, slow down, make their way through it, and leave on the other side. Over time, the jam is still there, but the individual cars come and go. That’s a density wave. Spiral arms are similar. The problem is we don’t understand how they get started or why they last so long. But a new idea has come along that may answer both. 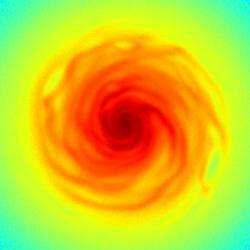 One of the simulations ran for four galactic rotations after the giant molecular cloud perturber was removed. The arms persisted. Astronomers created a computer model of a galaxy disk made up of 100 million stars (test particles, as they’re called) and let them interact through gravity. They also added huge clouds of gas and dust called giant molecular clouds (GMCs) to the simulation and let them orbit as well. What they found is that the GMCs poked at the smoother gravity of the disk, perturbing it. Over time, as the stars circled the galactic center, the effect was to create a spiral pattern in the disk, just like those seen in real galaxies. Not only that, but once created, the spiral pattern persisted even after the GMCs were removed (which can happen; they collapse to form stars in the real Universe). This new result is interesting because it solves some problems of the older ideas. One was that the arms are self-sustaining through their own gravity, but a lot of simplifying assumptions had to be made for that to be true. The new simulations show the arms are able to stick around without those assumptions. Their simulations also show that once created, local fluctuations in the density of stars in the arm act to perturb the disk, creating the conditions needed to sustain the arms, even once the “seed” perturbers go away. Sustaining the arms has been a long-standing problem in galactic physics, and this may be the solution. Of course, there’s always more to learn and more things to add to the models. I expect this will be a fruitful course of investigation for a long time. The Sun orbits the center of the galaxy roughly once every 240 million years or so. It passes in and out of spiral arms as it does so, and we’ve known for some time that we are between two major arms: the Perseus arm (because you can see it in the direction of the constellation Perseus) and the Sagittarius arm. It was thought we were in a weak spur, called the Local Arm, a small linear feature that branches off a major arm at a steep angle. But new observations using the Very Long Baseline Array radio observatory indicate that our Local Arm is not just a spur, but either a large branch off the Perseus arm or a major arm unto itself. A map of our galaxy, including the new measurements of the Local Arm. Click to galactinate. They did this by looking at star-forming gas clouds using the radio array. A fancy technique called interferometry allowed them to get very precise measurements of the positions of the clouds. They then observed the clouds over time, as the Earth orbited the Sun. Our changing position relative to those clouds is tiny but enough to see a small shift in their position. This technique is called parallax, and it’s been used for a long time to determine the distance to nearby stars. Now we can use it with radio arrays to get accurate distances and positions for some objects much farther away. The astronomers used this to map the three-dimensional location of these clouds, essentially mapping out the local arm. What they found is that the pitch angle, the angle at which our arm curls away from the galactic center, is low; in other words, it only curls away very slowly and doesn’t stick out, pointing away from the galactic center like spurs do. They also found it’s very long, more than 15,000 light-years end-to-end. The Milky Way is about 100,000 light-years across, so this is a substantial distance. So it looks like we’re not in a spur, but a bona fide previously unknown arm. Go us! What I like about both of these new results is that we’re finding surprising things about the Milky Way, even though we’re inside it. It’s like living in a house your whole life and then finding a new room in it, or one that was bigger than you thought, and that the house wasn’t originally constructed the way you thought it was. In some ways our own galaxy is the hardest to study. You live inside your head, but without a mirror, you’d never know what your face looks like; it’s easier to see other people and extrapolate from that. We do that with galactic astronomy, and with new techniques and better computers we can get a better grasp of our own house. And although this might all seem esoteric and weird, it’s not. Well, it is, but it really is also about where we live. If you go outside on a dark evening in the (Northern Hemisphere) summer months, the Milky Way dominates the sky. You can see it as a white fuzzy glow stretching across the entire sky. For millennia we had no idea what that light was, but now we know it’s the combined might of hundreds of billions of stars, a disk so huge it takes light 1,000 centuries to cross it, and it’s home. And every day, we get better at understanding it.